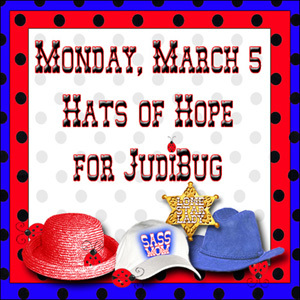 Today is HATS of HOPE for Judi-Bug. I put on my hat in honor of Judi-Bug and am sending her all our purrrrrs. Our friend is Judi and we are sending her purrrs loud and true as she awaits the results of her tests. We are joining together with other dogs and cats on the blogosphere to surround her with all the good thoughts that we can. If you'd like to join us, please do. And if you'd like to visit Judi, please click below. That's a cute little hat! We're sending our love and purrs and woofs and prayers to Mom Judi. 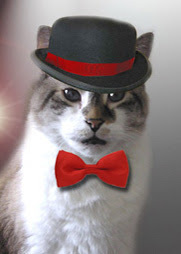 We think you looked very dapper in that hat and bow tie. We're participating too, and are purring and purraying hard for Judi. All 40 paws at our house are crossed fur Ms. Judi. We're sending lots of prayers and good vibes her way. Gosh, you wore a hat AND a bow-tie! Nice work! Thanks so much for purring for Miss Judi! We're wearing our hats today too. We're purring hard and loud for Judi. We love your hat Max - you look quite the city gent. We are wearing the hats she did for us again today. Love that hat! We all love Mom Judi and send our purrs, love, hugs and support each and every day. Miss Judi is in our thoughts and prayers. We posted out hat pictures, too. WE are purring our loudest! WOW - those are really cool hats that mom Judi made for you. It's nice to see everyone wearing their special hat. We are purring for Mom Judi and hope she will be well. We're purring and praying for Mom Judi, too.